Choose your own salad combo at Savage Salads. Japanese food tends to be light and healthy, as long as you stay away from the kara-age (fried chicken) and whipped cream-heavy patisserie. 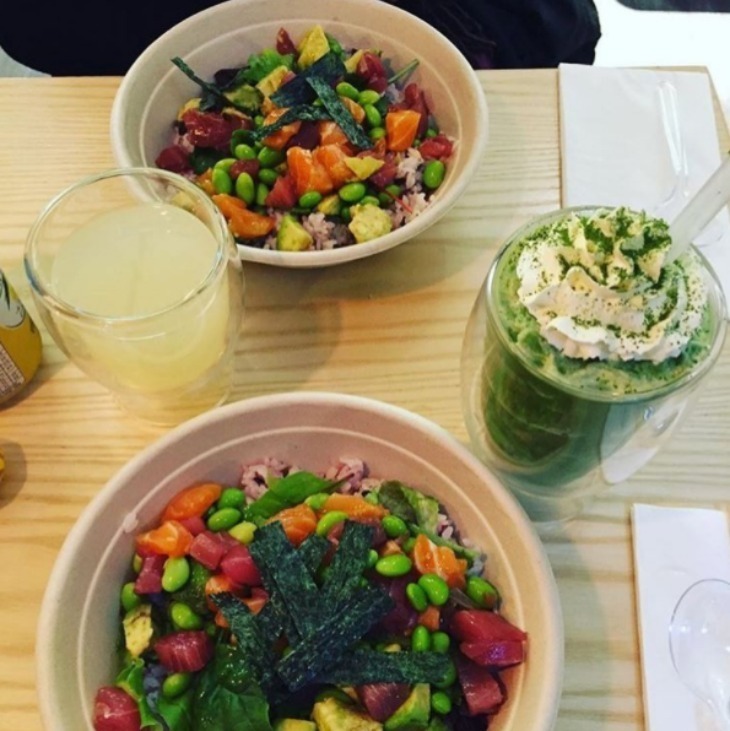 Tombo, in South Kensington has a large menu of healthy options to choose from, with sushi, sashimi, and London’s newest fishy craze, poke (poke-ay). In case you missed it, poke is a Hawaiian dish, which consists of cubed fish, with a selection of toppings and pickles. They also have a matcha bar with a range of green tea drinks to make you feel sprightly. Just remember to go with good intentions — you need to think more Flowering Osmanthus Tea than matcha soft serve ice cream. Light and healthy poke bowls at Tombo. These guys generate queues that stretch right down Berwick Street every lunchtime and they've now expanded to three differents sites. 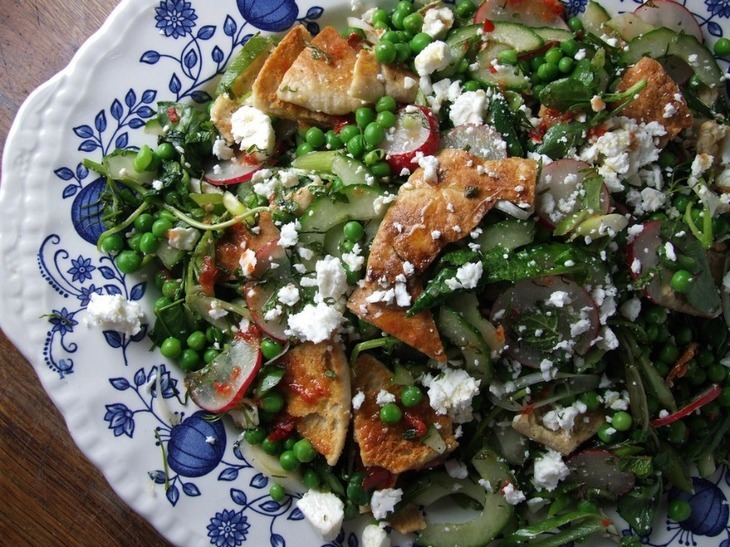 The idea of leaves for lunch can seem dreary but these are salads with attitude. Think chunky coleslaws made with cabbage and orange zest, roasted sweet potato with seeds and lentils and toppings like grilled chicken, halloumi cheese (c’mon, you can have a bit of cheese) and toasted pitta. The key to their success is that everything is packed with flavour and you can choose lots of different salads in one box, so there’s no chance of boredom halfway through. Seafood is always a good bet when you’re watching your diet as it’s generally very low in fat. 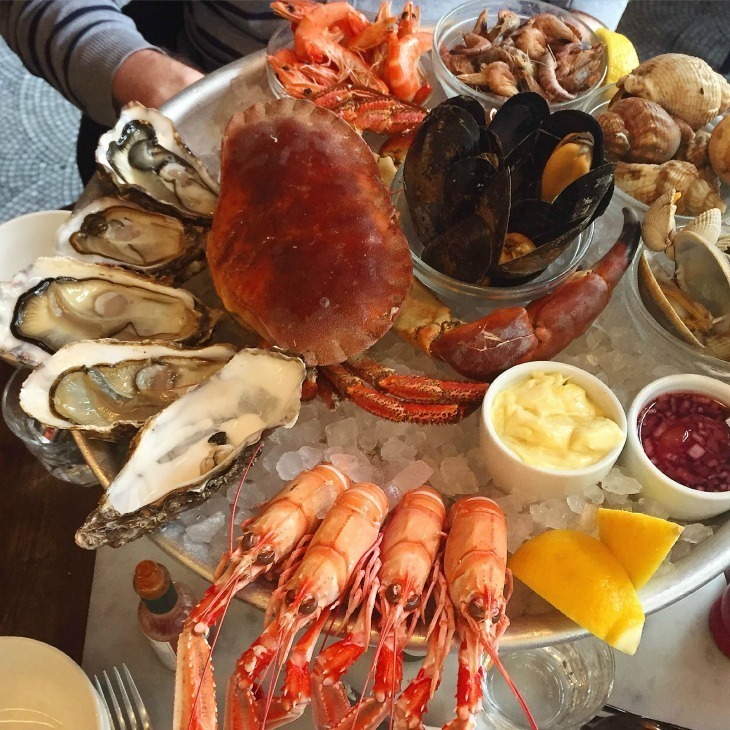 We love that Wright Bros. do an oyster happy hour which is, in fact, three hours long (3pm – 6pm on weekdays) when all oysters are £1 a pop and virtually calorie free. Prawns, crab and grilled fish are all good bets – just make sure to watch out for the mayonnaise, bread and butter sauces. There are a few branches to choose from. Who can resist an Ottolenghi salad display? The Ottolenghi restaurants are not cheap, but everything is great quality and tastes amazing as a result. The spread of salad bowls in the window is always super colourful, too. 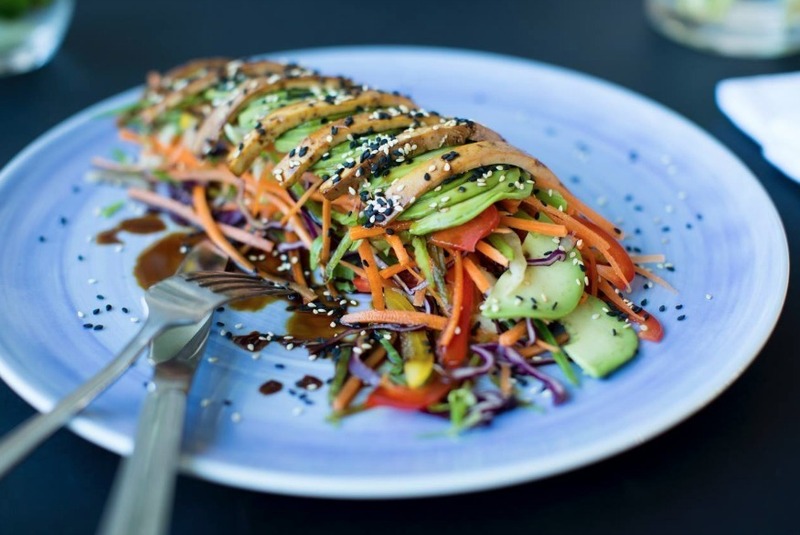 Along the lines of Savage Salads, the way to approach this is to get a salad combination so there are lots of different flavours and textures to make your healthy lunch more of a pleasure than a chore. There may be lots of dressings and a few fats going on here but remember that sustainable healthy eating is more about eating unprocessed foods like fruit and vegetables than it is about counting calories. That’s what we think, anyway. A healthy lunch at The Gate. The Gate restaurants are a popular chain of vegetarian restaurants offering wholesome dishes, some of which are also available without gluten or dairy. 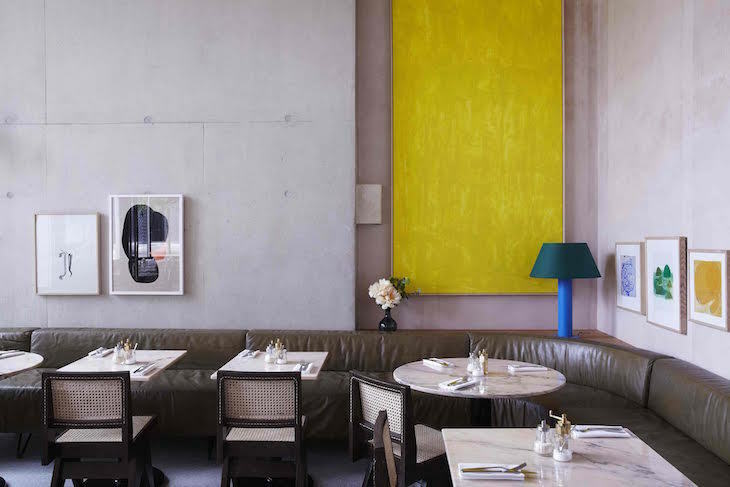 The menu features internationally inspired influences, for example, miso glazed aubergine, mezze plates, Thai green curry and vegan cheesecake. The wine list is surprisingly punchy for a casual restaurant but there are cocktails at around the £8-9 mark and a selection of beers and other drinks. Ooh, fancy! 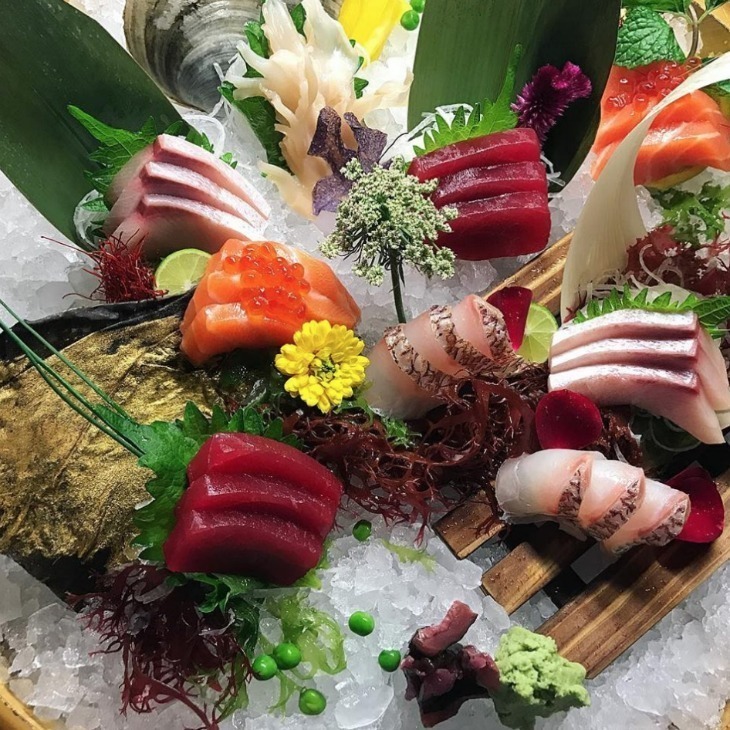 A sashimi selection at Sushi Samba. Sushi is an obvious choice if you’re on a health kick. We still don’t have a huge amount of great sushi restaurants in London and the good ones are not cheap. Sushi Samba ticks the boxes then because the sushi is good quality and you get the experience of dining high up inside the Heron Tower, which makes the meal feel like more of an occasion. Service in the bar isn’t great in our experience, so avoid that and get straight down to the business of eating. For the best sushi in London, you'll need to ditch the views and head to Sushi Tetsu in Clerkenwell, but getting a table is the problem – keep an eye on their Twitter feed for available spaces. 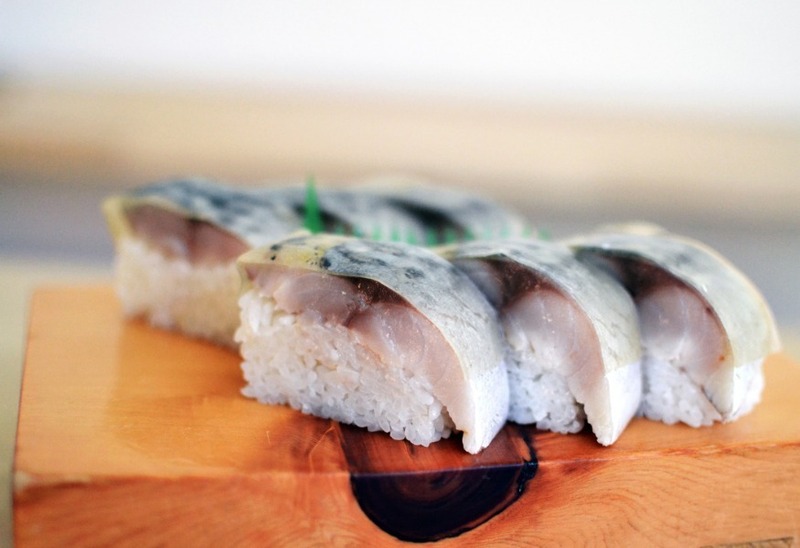 Find good quality, reasonably priced sushi at Atari-Ya Sushi Bar. If it’s more reasonably priced sushi you’re after, then you could do a lot worse than heading to Atari-Ya Sushi Bar, a sushi and sashimi bar chain from the excellent Atari-Ya Japanese supermarket. They use their own supply of fish, so you’ll find options on the menu you won’t see in other places in the same price range, like two types of fatty tuna and grilled salmon jaw (the head parts of fish are prized in Japan, and surprisingly good to eat). Sweet potato waffle at Grain Store. 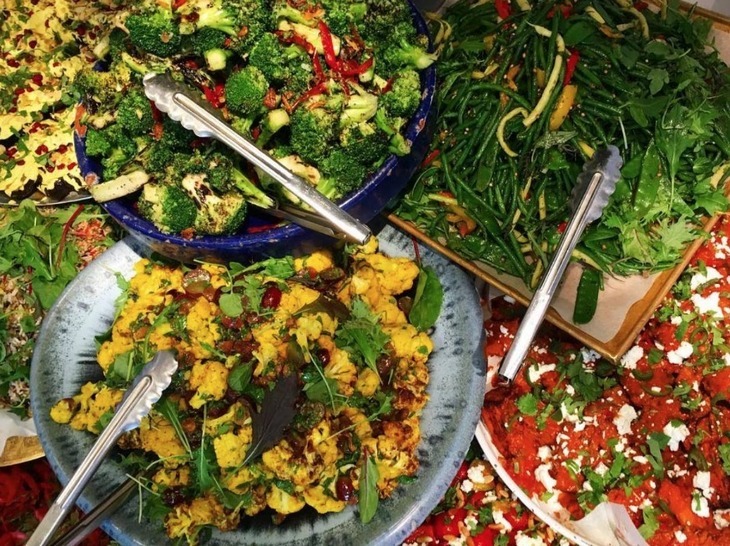 Bruno Loubet’s Grain Store takes a sensible rather than strict approach to healthy eating. 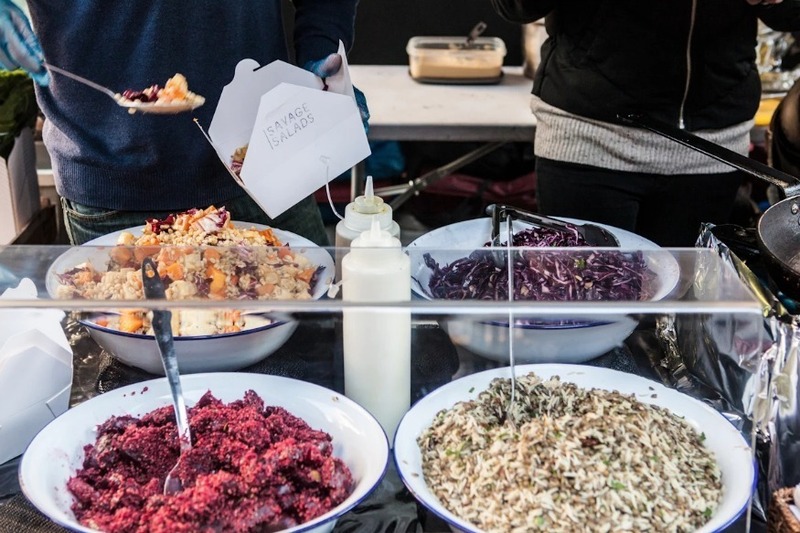 The menu is vegetable-heavy and includes dishes such as veggie chilli con carne, vegetable borsch with gluten free dumplings and grilled sweet potato with yoghurt and chilli-lime dressing. There’s also an extensive brunch menu and a branch at Gatwick Airport, which considering the quality of airport food around London, is an absolute Godsend. A Granger & Co. restaurant. 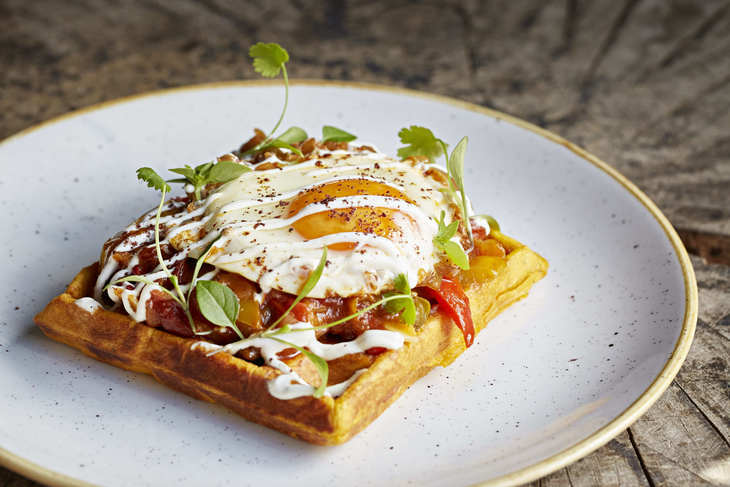 There’s a freshness about the food at Granger & Co. that has people queuing down the street for their brunch every weekend. They actually serve food all day, with plenty of healthy options, such as hot smoked salmon with poached eggs and greens on the breakfast menu, yellow fish curry with roast squash and brown rice at lunch and a shrimp burger with a shaved radish salad and jalapeno mayo at dinner. Enjoy fresh salads like fattoush at Al Waha. Much of Lebanese food is fresh and healthy, and Al Waha is one of London’s most popular spots. Stick to fresh, vegetable based dips like moutabel, a smoky, grilled dip with tahini and yoghurt and salads like fattoush. The best thing about Lebanese food is that you can order lots of different dishes to share, meaning you won’t get bored with just one. Just remember to stay away from the fried snacks and syrup laden desserts.